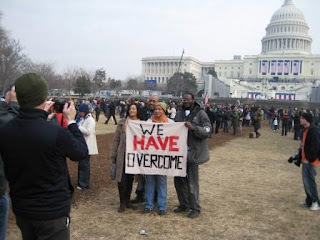 I love the concept of this photo, the guy in the green hat (taking the photo) made the sign and allowed people to hold it up and pose for photos (for free). I think this guy's name is Marshall (I have short-term memory). 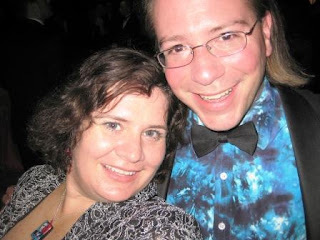 Can you tell we were at the Mid-Atlantic Ball with The Dead? I joked about wearing a tie dye gown to the event or maybe tights. But this guy actually came through wore a tie dye shirt! And isn't he adorable? 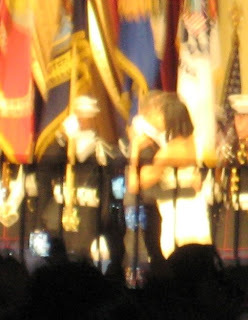 Consider this an abstract photo of the Obamas dancing. That's what I saw, or at least what my camera saw. My best view of the First Couple was on the oversized screens. You did it! How many can say that? I hope that you get some well needed rest this weekend. Dreaming of a possible new car. I know the feeling. I have 1300 miles on my 1999 Ford Taurus and I am wondering what to do. I think I will hold tight for now. Jenn, thank you for your wonderful Quirky Kitsch Girl's View.